Governor General, Her Excellency the Most Hon. 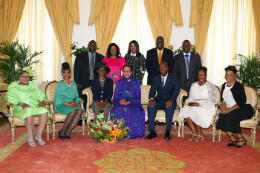 Dame Marguerite Pindling welcomed Mrs. Kathleen Moxey who celebrated her 92nd birthday to Government House, Thursday, March 7, 2019. The Governor General presented Mrs. Moxey, who came with several of her family members, with an arrangement of flowers.